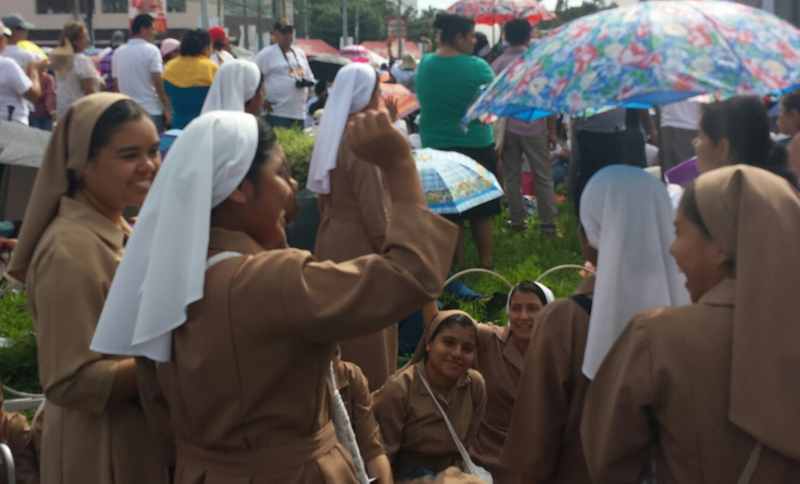 Dateline San Salvador: beatification celebration for Monsr. Oscar Arnulfo Romero is building up momentun, playing Sombrero Azul, the national anthem of the revolutionary left during the bloody barbaric civil war that laid the cultural, economic and political foundation for the current gang–government slaughter in this muy sufrido pueblo. Then, the journalist watches the 4´5 nun, who starts ecstatically singing “Dale Salvadoreno!”, raising her fist, erasing in that moment all distinction between ´religion´and ´revolucion,´ between the hope of this life and the hope of the next. As he watched the nun, as he listened to the music and as he remembered the sufrimiento he´d known–a sufrimiento that was melting, washing away in that momentary collapse brought on by the miraculous– the journalist cried, washing the word “periodista” (journalist) on his credential onto the floor of forgetting. And in the flood of tears,the journalist became water mixed with blood and swished and disappeared into the ground, giving rise to another Romero, one of millions rising prophetically out of the Crowd of Former Nobody´s. He has risen.